Associate Artists projects and support. positive, challenging, inspiring and fun. creative projects for people looking to develop new skills or try out a new activity. to give an interactive, informative and fun way of learning about history. training and ongoing professional development as community facilitators and practitioners.  Green Shoes Arts Green Shoes Arts is a Barking and Dagenham based arts organisation offering creative opportunities to the local community. We provide creative activities for all ages and abilities in dance, drama, photography, visual arts and film making, alongside leadership skills and Associate Artists projects and support.  Youth Projects Green Shoes Arts is a community arts organisation based in Barking & Dagenham committed to providing children and young people with creative opportunities that are positive, challenging, inspiring and fun. 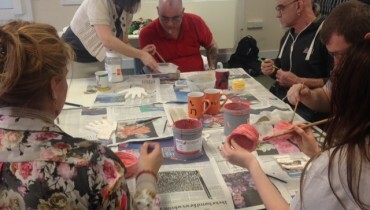  Adults Projects Green Shoes Arts offers a number of projects for adults with learning difficulties, projects for people with mental health, dance projects older adults and general creative projects for people looking to develop new skills or try out a new activity.  Inspire Festival The Inspire Festival is part of Barking & Dagenham’s 50th Anniversary celebrations as a school based arts and culture festival. Inspire brings together dancers, actors, artists and musicians to celebrate 50 Years of Barking and Dagenham and explores some of the local, national, and international events, movements and ideas that shaped 1965 and beyond. Welcome to Green Shoes Arts. We are a passionate team of professional arts facilitators based in the London Borough of Barking and Dagenham who want to see positive change in our local community through participation in the arts. We know that being involved with the arts as a participant or as an audience member can have a profound effect on people’s lives. Whether it is running a film project for young people at risk of exclusion or giving adults with learning difficulties the chance to create stories and perform in front of an audience, we know that life is made more enjoyable and rewarding when we spend time doing something creative with a group of friends, old and new. We work with people of all age groups from all communities living in Barking & Dagenham. We want to make arts accessible to all and promote the many benefits that being involved in the arts can bring. Want to know more about us? Give us a call, pop in and see us or click through our website to see some of the faces of people we work with – they’re a brilliant group! Thanks to our funders’ and partners’ belief in the vision of Green Shoes Arts we can continue to provide programmes which speak directly to the needs and interests of our community.